A recent Pacific Island graduation and open day demonstrated yet again the deepening response from the Pacific community to provide support for prisoners and their return to the community on release. The Polynesian Art Creation graduation at Vaka Fa’aola (the Pacific Focus Unit at Spring Hill Corrections Facility in Te Kauwhata, Waikato) was “a fantastic affirmation” of both its programme initiatives and the community, says Asenati Lole-Taylor, Regional Adviser, Pacific Development, RRS Northern Region – also known to the Pacific community as Le’au (Le’aufa’amulia), her orator chief name. The Polynesian Art Creation programme initiatives marry the elements of traditional learning and performance, the contemporary Pacific craft of weaving, and traditional screen printing. However, it’s the ties of family, of community and the wider Pacific networks that demonstrate what can be achieved when prisoners are supported to live back in the community on release. 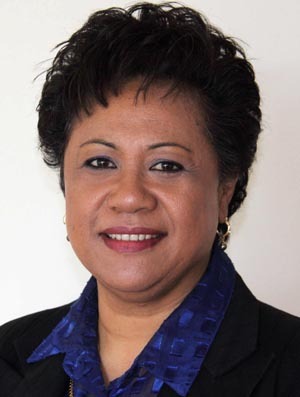 Mary Ama is a prison art tutor, an Auckland-based arts practitioner, and Pacific Arts Advocate, Community Development – Arts and Culture at Auckland Council (Waitakere). Asenati describes Mary as the “cornerstone of art making” at both the Pacific Focus Unit at Spring Hill and Auckland Region Women’s Corrections Facility at Wiri. 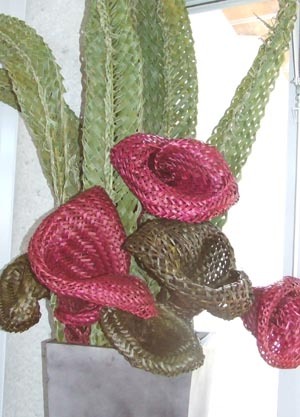 Mary is the inspiration behind the unique, man-sized bouquets, woven from palm leaves and laufala (flax), and the traditional screen printing and dying processes. 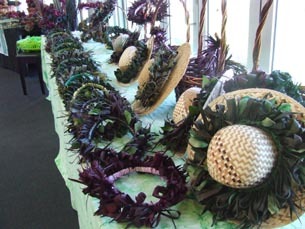 Asenati says she also works alongside community groups that support the Polynesian Art Creation programme initiatives. One of these groups is the Mamas and Papas from the Auckland Council’s Pacific Art Centre. Asenati says they are respected Pacific Island elders who are not related or necessarily known to the men but who engage with prisoners in a way that few others are able to. Their innate ease and patience help the men rebuild their trust. “One of the fascinating elements of this group is the role of older women. The Mamas give an instruction, and the men recognise it and simply don’t argue,” Asenati says. Another group providing support for the programme initiatives, and for Mary Ama in her role as Fautua Pasefika, is the Pacific Mothers from Waitakere, Tiana Epati and Mata Tupae. Original generation time 1.3623 seconds. Cache Loaded in: 0.0004 seconds.